I had Geyser out the other nite at a shopping center, to be there in the dark. She did fine, which was great. I'm sure this is just the beginning of the interesting IDs I'll be getting from other people, but this guy walked by us and said she looked like a Louisiana hound...you know, "with that funky coloring and all..." . He couldn't figure the ears tho . So, what kind of IDs have you gotten on your DSs? Lots of pit mix questions, greyhound mix, GSD mix, GSD/lab, Black GSD (huh? He's got stripes! ), and the ever popular, what IS that? Once a guy asked me what kind of dog he was, I told him Dutch Shepherd, and he then replied 'Oh, I used to breed those'. Ummm, k,thx....? Weird. I love it when people ask what he is, and then act like I made up the breed, cause they've never heard of DS's. They think I have a mutt, and I feel the need to give him a fancy name. Whatever floats your boat, folks! Does not bother me if you think my dog is a mutt. I think my favorite was just the other day. A black dude (sorry to sterotype, but he was very gangster/thug like. Belt tight, BELOW his bum holding his pants on) Anyhow... I was out on the tennis court working on obedience. Tug is our reward, so it's pretty high energy, with lots of noise. This guy asked me if my dog was a purebred canine. ROFL! I didn't bother to go into the details with him.... I think what he was trying to ask was if Koenig was a police k-9, but I really have no idea. We wrapped up that training sessions really quick and went back in the house. I think he was asking you if your dog was a purebred K9<g>, which is the street word for police dog. I know the, "do you know what kind of mix that is?" one, for sure! That's really funny about the guy who asked what breed you had, then said he used to breed them himself<BG>. 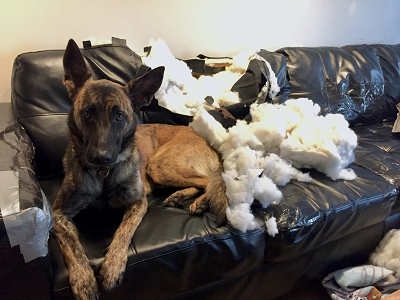 Tell us about yourself: New Dutch Shepherd owner. Used to own/train Beaucerons. But I'm used to that- experienced it more ofthen with my Beaucerons. Mostly the difference is the average person once they walk away can't spell Beauceron. They could spell Dutch Shepherd and if they get home and curious enough to look it up, they can (which I've had that happen too, people will come up to me in my neighborhood and say "hey I looked up Dutch Shepherd and..."
Hell, I'm sure I'd have to try a couple times to spell Beauceron correctly. (and my computer just told me I did it wrong, again). I can ID them though- stunning dogs!!! I'd love to own one some day. Today I had Letty out at the Schutzhund club. Everyone was sitting around to see her and watch the Training Director playing with her. A guy that is newer in my Schutzhund club asked me how many Malinois I owned. I said 0 and didn't elaborate. After a few minutes he asked me what kind of dog Letty was. LOL! He thought she was a Malinois. So now in 1 day he got to meet 3 dogs of a breed he's never seen before. Oh, now, hyena, that's a good one! k9katet wrote: Today I had Letty out at the Schutzhund club. Everyone was sitting around to see her and watch the Training Director playing with her. A guy that is newer in my Schutzhund club asked me how many Malinois I owned. I said 0 and didn't elaborate. After a few minutes he asked me what kind of dog Letty was. LOL! He thought she was a Malinois. So now in 1 day he got to meet 3 dogs of a breed he's never seen before. How is Letty doing? Geyser weighs 35 lbs now, and I'd guess your girl is about the same. Ears have been up for a few weeks, too. Since she's teething, she's become serious about biting again<sigh>. Letty is doing very well. She was at the vet a few days ago and 35.5 pounds so they are about the same. Her ears have always been up. Her biting is not a problem at all. She almost never bites and when she does we say "ouch" and she stops and goes and gets a toy. We're on our second round of antibiotics for her UTI. It was bad originally so hopefully this will be the last round. Her puppy agility foundation class only has a few weeks left. But the guy that was coming in once a month to lecture and give us direction on what to work on is going to be continuing the class. But he'll be the one teaching it ever week. And it'll be only 30 minutes away - almost an hour closer!!! He's going to be teaching a handling class too and he follows the same system that I do so I'm very happy about that. I'll have Vada and Seven in that class. It will be interesting to see what conflicts I run into between that class and my Schutzhund training. Not really much new. Just busy all the time. Haven't been good about taking pics really either. Glad she's doing well, tho sorry to hear about the UTI. Hope that clears up! Just ignore my other post with the question about her weight...forgot I'd asked you here<G>. Yup, they're the same. I think it's getting worse. The vet said to finish out the antibiotics and then we'll do culture on the next urine sample. I think I see crystals but she says there are none. It's a mystery. But the globs of mucus are back. She seems very calm lately too but I've been home alot and outside painting while she and Vada play so it could be that too. I wish it could go away. Poor puppy! k9katet wrote: I think it's getting worse. The vet said to finish out the antibiotics and then we'll do culture on the next urine sample. I think I see crystals but she says there are none. It's a mystery. But the globs of mucus are back. She seems very calm lately too but I've been home alot and outside painting while she and Vada play so it could be that too. I wish it could go away. Poor puppy! I feel for her, and you! We had puppy vaginitis for about 2 months, but that's gone now. I just treated it with cranberry extract and Vit C.
I had all the above 'mix' guesses. And even the "what is that....Oh...I used to breed those". I still go into cardiac arrest when someone walks up to me and says "that is a Dutch Shepherd" Holy cr**. It always catches me off guard. vneerland wrote: I had all the above 'mix' guesses. And even the "what is that....Oh...I used to breed those". I went into a different pet store the other day. The gal behind the counter asked if that was a DS, and I did almost go into cardiac arrest!!!!! I was SO shocked! Koenig promptly hopped up onto the counter to be adored. This lady was from the East Coast, and used to belong to a FR club that has DS's. Probably the "Louisiana dog" is a Plott hound, not that Plott hounds are indigenous to the state. I have had several dummies ask if my DS was a wolf and then I was doing patrol work at an out of town festival and later in the evening one drunk stumbled over and had the nerve to say 'well what kind of puppy is that, she is just a baby'. Zip evidently was offended by that remark and proceeded to show her pearlie whites!!! I was thinking, yeh, puppy my hiney!! Dynamite comes in small packages ya know. Zip is all of 55 lbs soaking wet. I sort of understand the man's statement because there was a Rott, three large Mals and two GSDs, all pbly twice Zip's size.